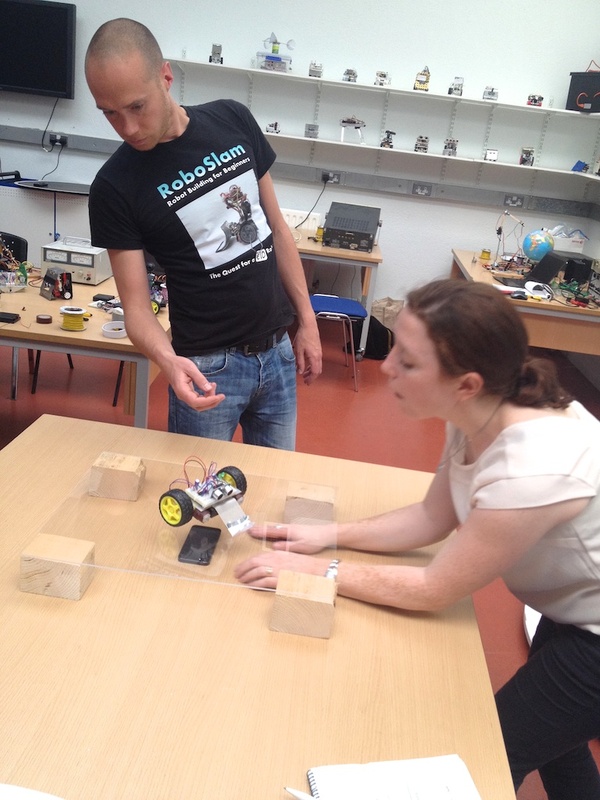 My colleagues who conducted the robotics workshop across town from mine last Friday sent photos of their RoboSlam. 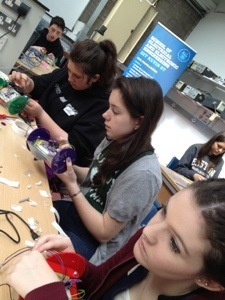 I’ve attached photos of the workshop held at Grangegoremen, now known as TU Dublin city campus. In all, we had 13 facilitators and over 40 participants join us for electronics workshops to celebrate International Women’s Day 2019. The events were organized by TU Dublin’s office of civic engagement, and their staff provided these photos. RTE’s Sinead Morris filming DIT’s Ted Burke using a kitted-out iPhone 5. 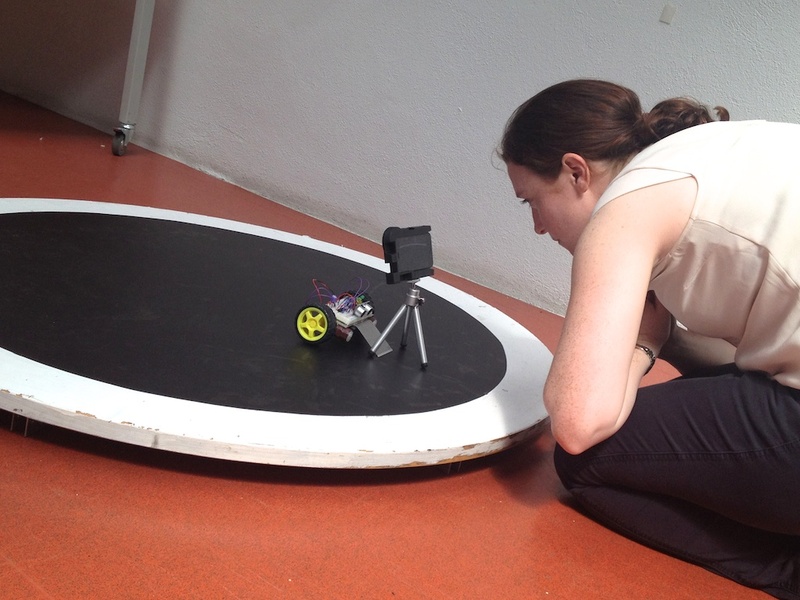 TV journalist Sinead Morris came to DIT’s Kevin Street location today to film robot construction in action. Our RoboSlam team leaders — Ted, Damon, Frank, and I — are preparing for the upcoming Dublin Maker event, to be held at Trinity College on Saturday, July 26. Sinead wanted to capture the activity. The Dublin Maker event served as the impetus, Sinead explained, but the main intention of her piece is to show what the RoboSlam group is doing with robotics. Sinead’s production is likely to air on RTE’s digital news channel, News Now. Ted and Sinead set up for a shot of the robot underworld. Sinead is testing photojournalism innovations. The Irish television company where she works, RTE, wants its journalists to gain experience with spontaneous, low-tech approaches — so staff members can shoot, edit, and post “on the go.” At the end of this innovation project, RTE staff will have the skills needed to disseminate news on the run… when opportunities arise. RTE asked its staff to take this challenge: produce interesting and informative pieces wholly on their iPhones. Hampton University journalism students were learning to do the same when my friend Tony Brown was dean of the program so, for me, watching this process firsthand proved fascinating. The move toward spontaneous creation of new content aligns with the goals for our RoboSlam project; we want our workshop participants to take their robots home and start creating new “home grown” code for operating the ‘bots. TV news technology has come a long way in my lifetime. When I was a kid in the ’70s and ’80s, my parents were television journalists. They used 16mm film equipment, and I learned to use the same when I was in college studying architecture. Today’s capture-edit-and-post culture speeds the process. Mom and Dad used to shoot the footage and put it on a Trailways bus bound for the TV station one hour away. While it was in transit, they’d phone the station to make a voice recording of the text for the station to overlay. It would appear in its synchronized form on that night’s news. Now, Viola!, Sinead can do, alone and in moments, what it took dozens of people hours to create in the 1980s. So, I was able to learn quite a bit from Sinead today, about software as well as hardware, and perhaps now I can give her videography techniques a go. She also inspired me to write up this blog on site, while she’s finishing up her interview with Ted. Moments ago, she asked him what it’s like to work this type of job. He said he loves coming in every day to build robots and work with students. He didn’t mention that he and his colleagues are currently on vacation and aren’t at all required to be here. They just can’t keep themselves away! We actually had quite a few interesting projects underway in the lab today while we were filming… a veritable Santa’s workshop of robotics. 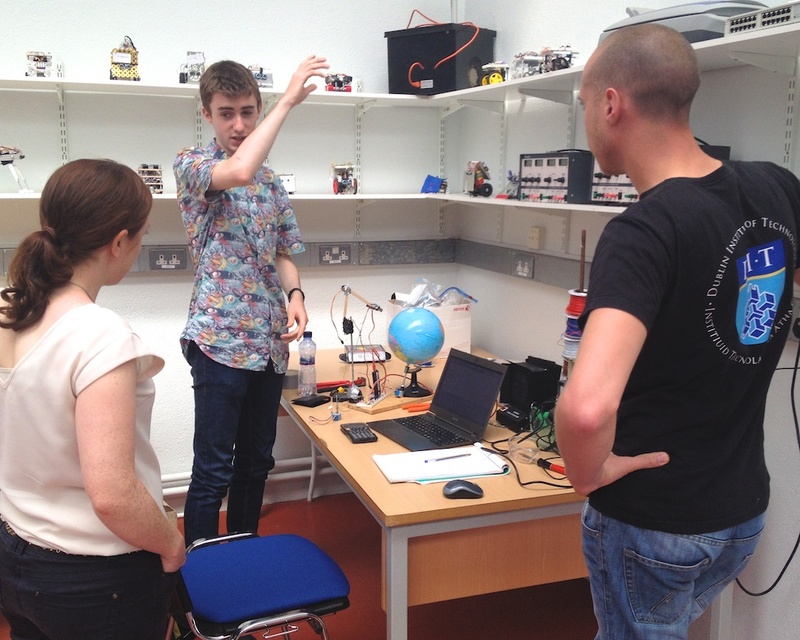 For instance, one of DIT’s third year students, Shane Ormonde, was here developing a new robot to show at the Dublin Maker event. He just completed a degree in Electrical and Control Engineering (DT009) and will pursue yet another degree in the fall. Shane Ormonde’s new global robot arm. Shane is building and programming a robotic system that, using a globe, can show in real time what the International Space Station is actually tracking at the same moment. Eventually, his robot will also be able to point to any location a person requests, using the laser on the end of its moving arm. The globe itself moves to set the correct longitude and the arm moves to pinpoint the latitude. He originally wanted people to be able to tune in via internet to ask the robot to identify specific locations and complete other such actions. Shane’s creation will be featured as one part of our DIT RoboSlam exhibit at the Dublin Maker event. Come join us next Saturday – near the cricket pitch at Trinity – and see! Ted, Damon, and I have been gearing up for future RoboSlam workshops. We have been looking for sponsors to help us continue and scale up our work. For now, we’ll have to keep things fairly small and simple. We’re not letting the lack of funds hold us back too much! We’ve got to keep our momentum going! During my Fulbright fellowship, I had several official projects. Along the way, I adopted a number of other projects–like RoboSlam–where I could learn and also contribute. Ted and Damon are so talented and passionate about what they do that it’s impossible not to want to contribute to the success of their project. While I was away studying in Rome, Ted and Damon hosted a workshop for people we hope will want to become facilitators of RoboSlam. It’s part of our strategy for getting more people involved in the project. Ted, Damon and I met to map out plans for a RoboSlam workshop for facilitators. We upgrade the design and the instructions each time we offer a workshop. Of course, we drank lots of tea and coffee (see all the cups!?!). Ireland has, I have been told, the highest per capita consumption of tea on the planet. At the end of the meeting, we went to see the Dean (Dr. Mike Murphy). At the following workshop, Damon took a picture of the group. It was small but enthusiastic! Here’s a diagram of the newest robot design. To read more, please see the RoboSlam blog on this topic. Two RoboSlam participants testing the performance of their robots. RoboSlam starts with an introduction to the overall robot-building process and then delves into assembling the electronic components (i.e., building the circuitry). The photos below track the progress of several groups of participants in the “Engineering Your Future” event held the week of May 13-17 at DIT. These photos were all taken by DIT’s current Fulbright Scholar in Engineering Education, Dr. Shannon Chance. Participants are welcome to download them and share them with others. Shannon will post images of the rest of the week in the days to come…. 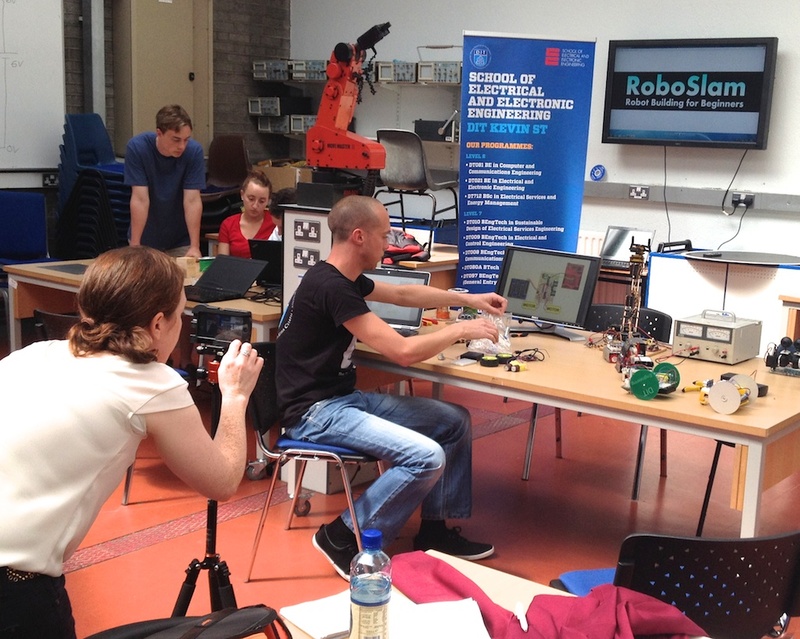 We are running a RoboSlam robot hacking workshop with high school (transition year) students here in Ireland. Having great fun and learning circuitry, programming, and lots more!